Another good question by Roger. 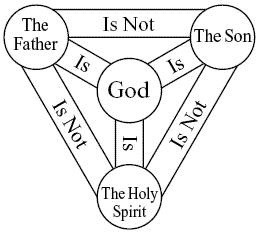 This is also a multi-pronged question about the nature of the Holy Trinity, and the relationship between the three Persons that co-exist together as One God. There seems to be two questions here, one concerning the nature of the Holy Trinity and one about Matthew 24:36. So I will answer them in two separate sections. CCC 266: “Now this is the Catholic faith: We worship one God in the Trinity and the Trinity in unity, without either confusing the persons or dividing the substance; for the person of the Father is one, the Son’s is another, the Holy Spirit’s another; but the Godhead of the Father, Son and Holy Spirit is one, their glory equal, their majesty coeternal” (Athanasian Creed: DS 75; ND 16). He may not have been speaking about the mystery of the trinity in particular, more of just understanding an infinite God with a finite human mind, but these sentiments can be applied here too. God is one, but He is also three. On the surface this would seem to be a contradiction, but it really isn’t. God is one being, but He exists in three co-equal person; Father, Son, and Holy Spirit. Each is a distinct person but shares in the same being, or substance, that is God. It comes down to how we understand the words “person” and “being.” A person is who we are, while a being is what we are. Sometimes a person is defined as a human, but that’s a limited idea of what a person is. Humans are persons, but so are angels and demons, and so is God. A person is classically defined as “an individual with a rational nature” this is why humans are persons but animals are not. Being, or substance, is a little more philosophical. You and I are human beings, Saint Michael the archangel is an angelic being, God is a divine being. So even though Father, Son, and Holy Spirit are separate persons, since they share in the same essential substance they are one. This is why the Council of Nicaea said that Jesus and the Father are “Homoousios” or of the same substance. The same council condemned the term “Homoiousios” because it means of similar substance. To say that Christ is “of a similar substance” as God would have one of two major implications; one would be a denial of Christ’s divinity since there is one God, anyone or anything not sharing in His divine substance or being could not be God. This could not be, because Christ said that He and the Father are one (John 10:30), and also claimed the divine Name for Himself (John 8:58). The other would be that there are more than one God, if they shared a similar substance then both would be considered divine and Christianity would cease to be a monotheistic religion. Since it was revealed to us in the Old Testament that God is one, and there are no others, then this too would be incompatible with revealed truth. This debate over the relation between Father and Son, and their substance, was so important that the Council Fathers wrote it into the creed that we profess at Mass to this day. We say Jesus is “Consubstantial” with the Father, and that’s just an English rendering of Homoousios. So the Father and the Son are one, but what about the Holy Spirit? He gets lost in the conversation sometimes. As the least mentioned member of the Holy Trinity, in the Bible at least, He is very misunderstood. Some have reduced Him to something akin to “the force” from Star Wars, or just like the aura of God. But we must remember that the Holy Spirit is a co-equal, co-eternal member of the Holy Trinity. He is not a “force” or “aura” but a divine person that is consubstantial with both the Father and the Son. Just as much a person of the Holy Trinity as the Father and Son. This one does sound perplexing on the surface. If Jesus is God, and God is all knowing, then how is there something that Jesus doesn’t know? Also how could God the Father know something, and yet God the Son doesn’t if they are truely consubstantial? There are two possibilities for how this verse fits with our knowledge of Jesus as the eternal Son of God; He was using hyperbole, or He was referring to His human nature, or maybe a combination of the two. Hyperbole (speaking in exaggeration for effect) was used extensively by Jewish rabbis during the time of Christ, we even have examples from Jesus himself. In Matthew 23:24 Jesus accuses the Pharisees of straining out gnats while swallowing camels. He wasn’t saying that they actually swallowed camels, but that they stressed over the smallest letter of the law (a gnat) while failing to observe the spirit of the whole law (the camel). Also He tells his disciples to pluck out their eyes of it causes them to sin (Matthew 5:29), and to hate your parents (Luke 14:26). In neither of these verses is Christ meaning to promote body mutilation or hatred for your family, but He is using hyperbole to make a larger point. So we can see that it’s possible for Jesus to have been making a hyperbolic statement when He said that even the angels, and the Son Himself, didn’t know the hour that the Father had appointed for His return. He may have been saying that it wasn’t important when He was to return, it was just important to know that He would return when the hour had come. We believe that Jesus was fully human, and also fully divine, and in that shared humanity and divinity were two distinct natures and wills, united in one person or hypostasis. This union of the human and divine natures of Christ has been called the Hypostatic Union. CCC 479: At the time appointed by God, the only Son of the Father, the eternal Word, that is, the Word and substantial Image of the Father, became incarnate; without losing his divine nature he has assumed human nature. CCC 480: Jesus Christ is true God and true man, in the unity of his divine person; for this reason he is the one and only mediator between God and men. CCC 481: Jesus Christ possesses two natures, one divine and the other human, not confused, but united in the one person of God’s Son. So in that He had two natures, He also had two levels of knowledge; his human knowledge, which by definition would be limited, and His divine knowledge, which by definition would be infinite. Saying that Jesus had limited knowledge sounds heretical on its face, but if we are talking about human knowledge then it is reasonable and backed up by scripture. And Jesus increased in wisdom and in stature,and in favor with God and man. In the verses immediately preceding this one we see Jesus teaching in the Temple, fully aware of His divine identity and teaching the teachers. If then He was fully aware of who He was, that He was the Son of God, how can He “grow in wisdom,” since God is the epitome of wisdom? Because in verse 52 Saint Luke is speaking of Jesus’ human nature and learning experiential wisdom and knowledge. CCC 472: This human soul that the Son of God assumed is endowed with a true human knowledge. As such, this knowledge could not in itself be unlimited: it was exercised in the historical conditions of his existence in space and time. This is why the Son of God could, when he became man, “increase in wisdom and in stature, and in favor with God and man”, and would even have to inquire for himself about what one in the human condition can learn only from experience. This corresponded to the reality of his voluntary emptying of himself, taking “the form of a slave”. So it is possible that when Jesus said that He didn’t even know the hour of His return, that He was speaking of His human knowledge. So as far as I can tell, it’s a matter of personal opinion as to whether He was exaggerating or speaking in His human nature. What’s important to remember is; 1. Jesus is fully God and of the same substance as the Father and the Holy Spirit. 2. Jesus will come again to judge all mankind, the fact that He will return is more important than the when. Thank you, Roger, for your question. This entry was posted in All Posts/Archive, Q & A, Uncategorized. Tagged catholic, God, Jesus, Questions, trinity.